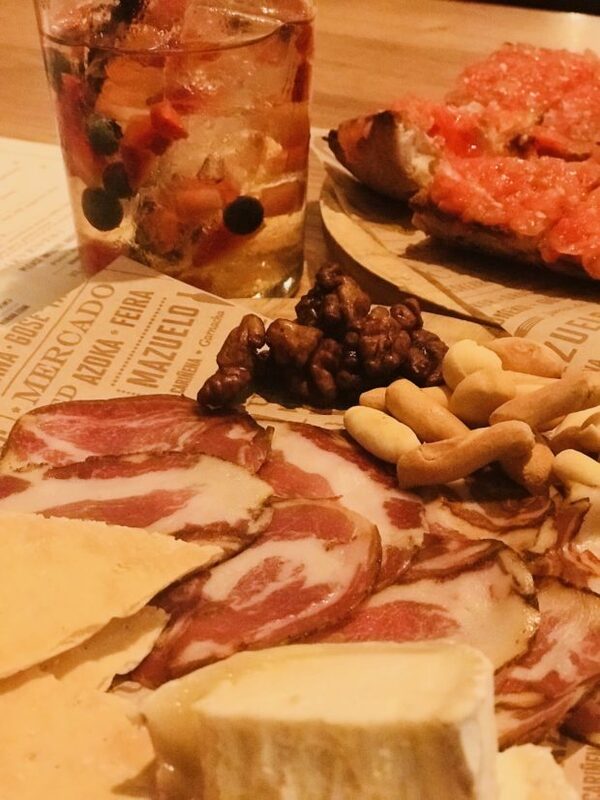 When Plano was founded in 1845, the early settlers mistakenly named the town with the word they thought was Spanish for ‘plains.’ But now, over 170 years later, residents and guests can enjoy some authentic Spanish at Bulla Gastrobar, the beautifully styled tapas destination in Plano’s Legacy West. 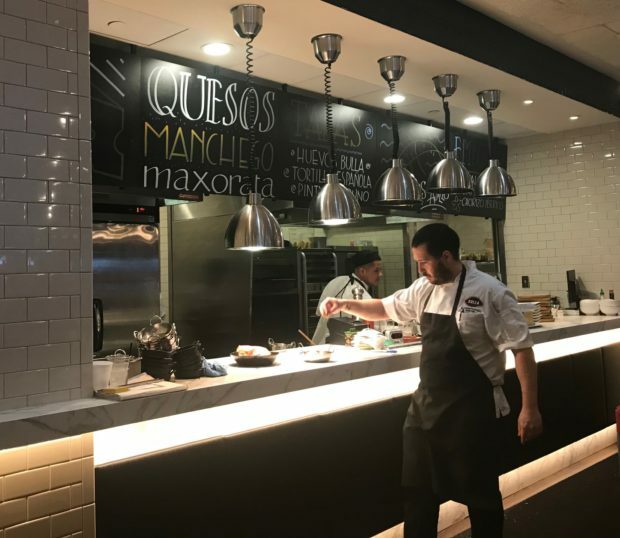 Bulla adjoins the beautiful new Renaissance Legacy West, and guests can valet park for free at the hotel, which was quite a coup on a busy Saturday night. 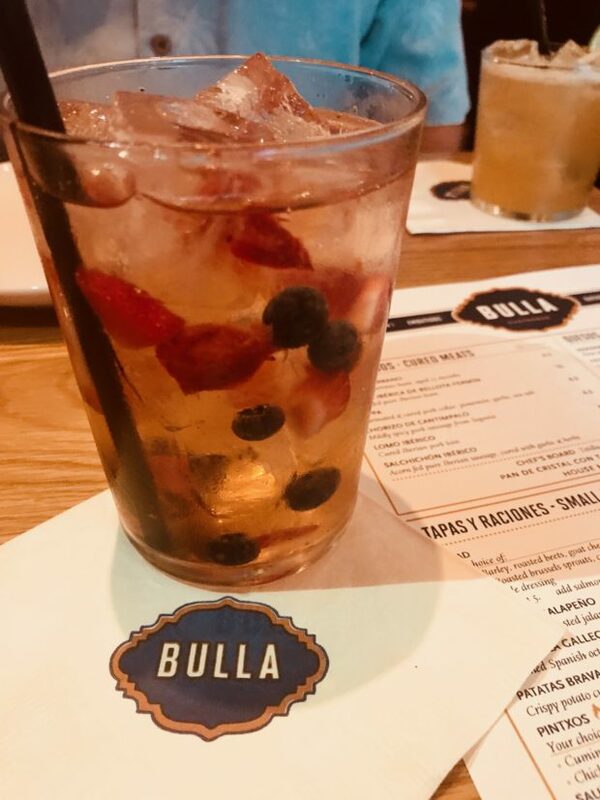 We opened our meal with a selection of Bulla’s new cocktails, including an effervescent white Sangria kissed with peach, strawberry and blueberry and a well-blended Spanish margarita, which owes its complexity to a hint of Amontilllado Sherry. A meal at Bulla is best started with a custom meat & cheese platter. 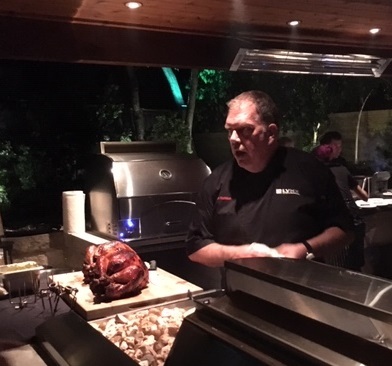 Ours featured a house marinated and cured Coppa and a tangy, flavor-forward Leonora, a soft goat cheese. The attractive platter is accompanied by flatbreads with membrillo and glazed walnuts. Next, we shared a dish my companion decided was reminiscent of what the gods must have for brunch. Huevos Bulla starts with delicate, crispy house made potato chips topped with two perfectly poached eggs, potato foam, paper-thin slices of Jamon Serrano and truffle oil. 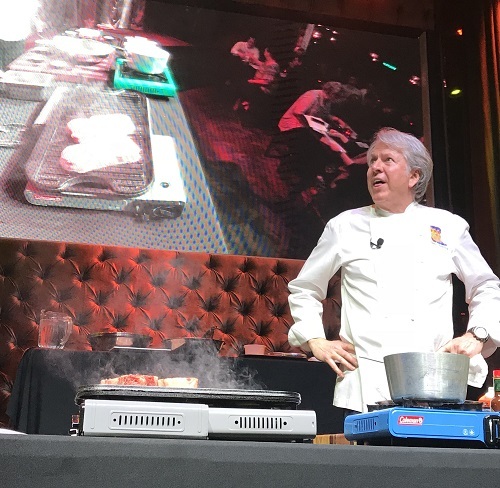 The dish looks awkward when it comes out, but it’s blended tableside and then served. Appearances notwithstanding, Huevos Bulla was a delicious, well-balanced dish, and we wanted to do everything short of licking the bowl. On the recommendation of our server, we tried a seasonally beautiful dish next. Bulla features a section of seasonal menu items and we tried the simply named Peas and Ham. 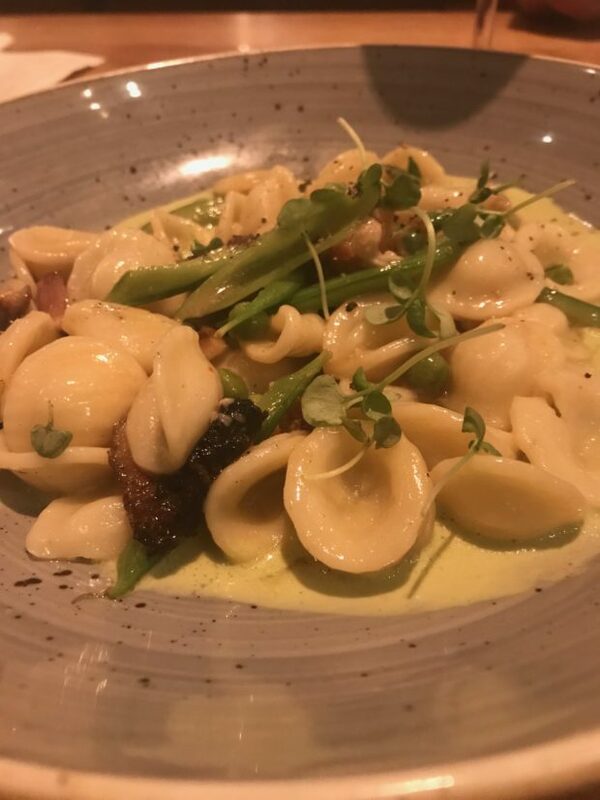 Salty, smoky Nueske’s bacon is cut into manageable lardons and crisped with carefully cut spring peas and then tossed with perfectly al dente orecchiette pasta with a fresh tasting pea puree. The simplicity of the dish really showcased the editorial eye of the culinary team and reminded that with great ingredients you don’t need to manipulate them too much. Bulla features a nice selection of Spanish wines, including a good number offered by the glass, and a Verdejo from Rueda was a perfect complement. Our evening was capped off by a seasonal dessert offering. 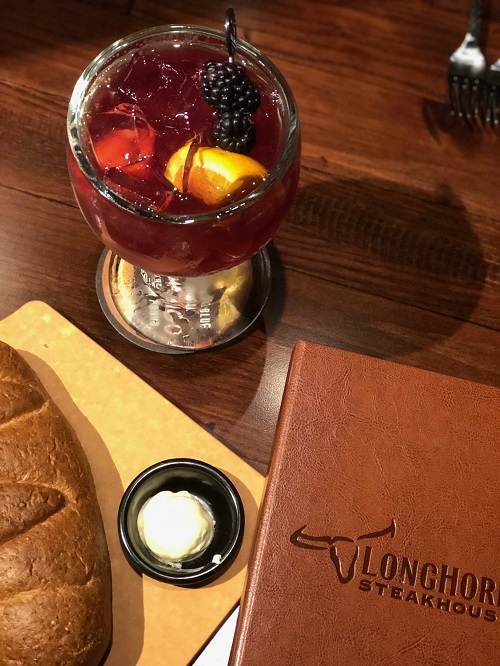 A delicate honey and ginger poached pear rested atop fresh berries, and was capped with additional honey, cinnamon syrup tableside. While the pear came with a scoop of ice cream, our server wisely suggested we add a delicious sherry to complement the pear, and it was the perfect way to end a very tranquil and tasty date night.